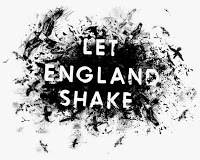 For this Valentine’s Day Monday, wink at the new album of British PJ Harvey (“Let England Shake”) and walk in the land of Johann Sebastian Bach’s with French-Italian Richard Galliano (“Bach”). Heart left, the artist Polly Jean Harvey, aka PJ Harvey, releases a new album: “Let England Shake” (2011). We love her album “White Chalk” released in 2007 and she is now back with a tenth album in which she plays a strange instrument : an autoharp (“musical string instrument having a series of chord bars attached to dampers, which, when depressed, mute all the strings other than those that form the desired chord. Despite its name, the autoharp is not a harp at all, but a chorded zither”, see Wikipedia ). Stage right, Richard Galliano explores the music of German classical composer Johann Sebastian Bach (1685-1750) : “Bach” (2010). Accordion, accordina and bandoneon are out for an amazing encounter.